Fired Earth Matt Emulsion is a soft, wipeable emulsion paint which dries to a chalky matt finish. Suitable for interior walls and ceilings, it provides excellent coverage and colour retention. Easy to apply and little odour. Please do not rely on a monitor screen to select colours but order a FREE Colour Card. Having chosen a colour from the colour card, we recommend you buy a Sample Pot to see your colour in situ? Fired Earth Matt Emulsion 2.5 Litre is a soft, wipeable emulsion paint which dries to a chalky matt finish. Looks great on interior walls and ceilings. This emulsion will give you excellent coverage and colour retention. It is easy to apply and has hardly any smell. 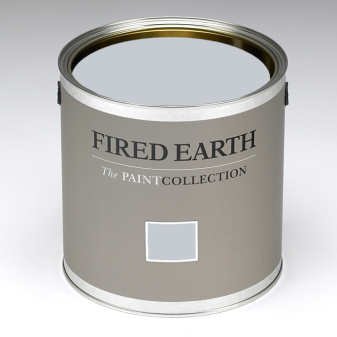 Fired Earth’s stunning Paint Collection allows you artfully to create a look distinctively yours. Allowing you to layer up your interior tone-on-tone over time. Key colours, for example, can combine with new naturals to act as a beautiful backdrop to treasured items. The 120 colours that make up Fired Earth’s palette have a delightfully matt and chalky finish. Fired Earth paints boast exceptional coverage. Thus leaving walls with a gorgeous depth of colour. Its hard to get this feel with cheaper, inferior brands. Natural daylight varies according to both the time of day and weather conditions. The same colour can often appear completely different from area to area and according to the height of the sun. The light when the full sun, for example, is streaming through a window has a very different feel to the muted light of an overcast day. This changeability is, of course, fascinating, but it can add an extra dimension when it comes to choosing the ideal colour. In addition, the direction the room is facing can also have a profound effect on the wall colours. Order a FREE Colour Card.